When you learn Spanish in a Spanish speaking country the course literature and the use of the new language is a part of everyday life. With a little initiative and determination, you learn to speak the language fluently. Seminar Teaching is done in groups of four to six students, organized so that the students can practice the language both orally and in writing. As part of the course you will also visit local organizations. Grammar classes are mainly lectures in Spanish and English. The lecturer is for the moment Norwegian. The most important part of the study is probably the time you spend to get into Argentine society and the everyday conversations with the people around you. Our Spanish studies are academic and gives credits equivalent full-time studies at home. 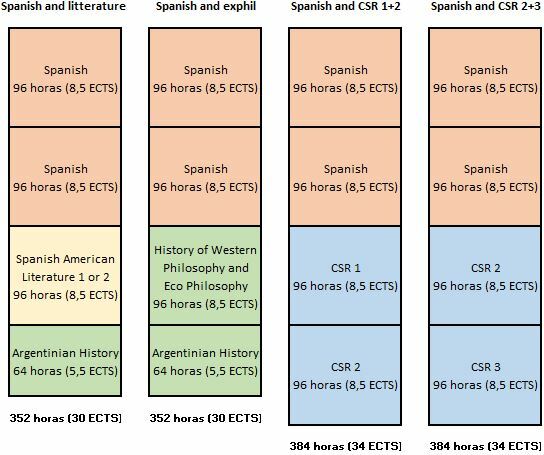 It is in other words not a regular language course, but a program that (if you choose further specialization courses) can give you qualifications to teach Spanish. To get a better understanding of the level of the different courses and what suits you best, you can take our diagnostic tests. Spanish pre-course If you are a Spanish beginner we offer a three weeks pre-course in Spanish, making you eligible for Spanish 1. Students are recruited mainly from Northern Europe. We also have Argentinian students on the programme. Students come from different backgrounds, both academically, professionally and personally, to the benefit of interesting discussions. About one third of the students come directly from upper secondary school, one third are in their early bachelor degree, and the last third are seasoned students. The main period: consists of four months of lectures, field trips, seminars, written assignments, oral and written exams in Buenos Aires. 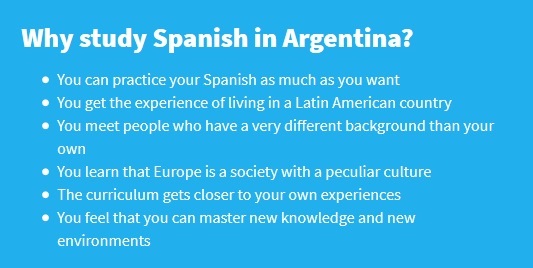 Would you like to take a full academic year with Spanish, you can continue on the next level in Argentina, or you can use the time between the semesters to practice Spanish while back packing your way through Latin America to Nicaragua where you continue the Spanish studies. Spanish is the second largest mother tongue language in the world, the second largest second language and the third most used language on the internet. You will not regret that you learned a language spoken by 500 miljioner people.